Earn 1 point for every dollar spent. ($1.99 = 1 point) Every 100 points receive $5 added value to your OPA! Rewards Card to spend on food and beverages. Offer valid on Dine-in and Take-out. One FREE Birthday Dinner* during your birthday month. 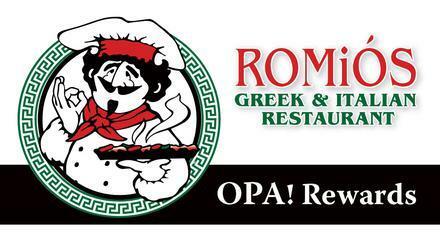 Visit ROMiO’S during your birthday month and receive 1 FREE Birthday Entrée* not to exceed $10.00. If entrée exceeds $10.00 then customer pays difference. Offer valid on Dine-in Only. Additional Rules & Information on Reward Programs. Only 1 rewards card may be applied per check. Any attempt to use the same Rewards Card on multiple split checks for the same table will void current visit and no rewards will be earned. Rewards Card and promotions subject to change without notice. All rewards offers end without notice.